Similar to traditional sidewalk Siamese connections. These connections have one storz inlet, 4" or 5" by 4" or 6" NPT. Comes complete with 90° storz connection, cap, 18" sleeve, and escutcheon plate. Bright aluminum. Painted red or Polished Aluminum optional. 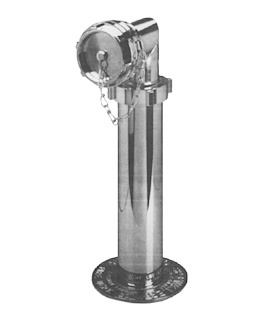 Specify "Auto-Sprinkler", or "Standpipe", or combination plate when ordering.